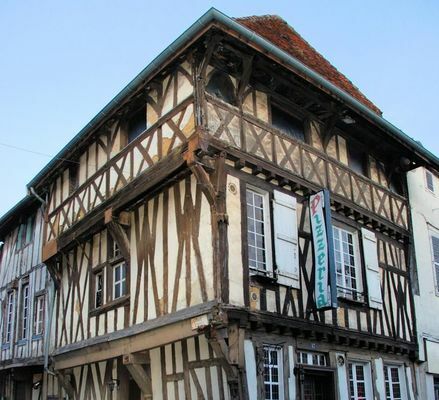 Around the Place Emile-Mauguet, three half-timbered houses dating from the 15th and 16th centuries stand out and give the city center an idea of ​​its former appearance. At No. 17, the House called 'Parcollet', named after one of the former owners, is the most famous and most picturesque (15th). This is the reason why the Minister of Fine Arts has classified among its Historical Monuments its facades and roof, by a decree of August 17, 1945. In n ° 4, the House of Rozières, name of the owner in 1571. Its facade and its frame are in chestnut wood, gasoline frequently used formerly because of its property to remove the spiders. On the facade, two heads of salamander, symbol of François 1st, adorn the ends of the sandpit, beam that separates the ground floor of the first floor. On the facade of No. 31 is mentioned 'Charles Francis', owner of the house in 1591. According to a tradition, it is at this location, that at the time of the siege of 1544, was killed on July 13 by a cannonball Cannon Captain Lalande. There is no review about Architecture En Pans De Bois, be the first to leave one !